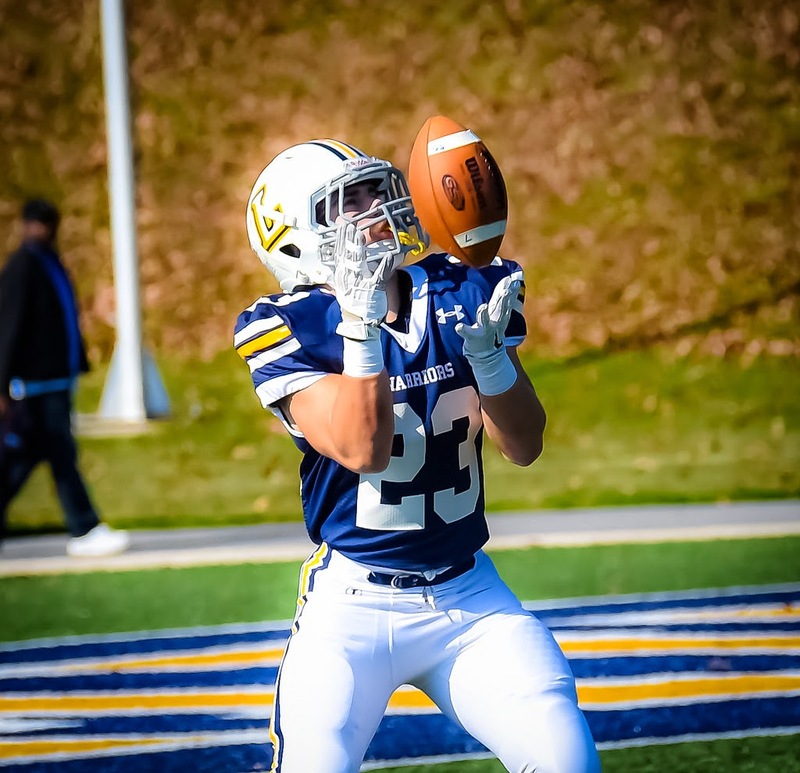 WILLIAMSPORT, Pa. – Junior Ryan Umpleby (Forest Hill, Md./Fallston) had a breakthrough day with 14 catches for 203 yards to lead the Lycoming College football team, but 13th-ranked Widener University used a 15-point second quarter to break away for a 34-17 Middle Atlantic Conference win in front of 3,478 fans at David Person Field on Saturday, Oct. 25. 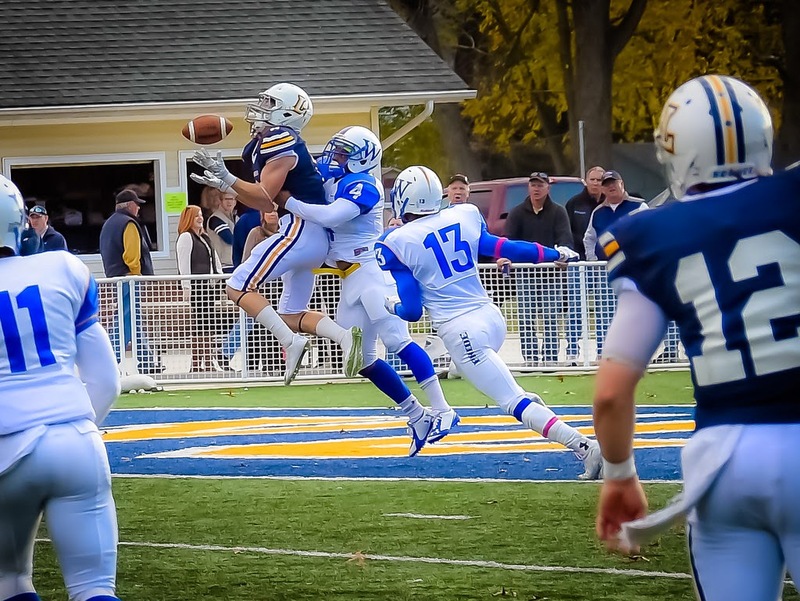 Umpleby’s performance was one of the best in Lycoming’s history, as his 14 catches and 203 yards are both the third-best marks in program history. He is the first Warrior to catch more than 10 passes in a game since Ryan Wagaman had 15 at Wilkes on Oct. 30, 2010 and the first to post a 200-yard receiving game since Warren Oliver posted a record 215 at Westminster on Sept. 10, 2011. Senior quarterback Tyler Jenny (Glasgow, Pa./Glendale) finished 25-of-47 for 281 yards and two touchdowns for the Warriors (6-2 overall, 5-2 MAC). He was intercepted once, as he finished under 60 percent passing for the first time this season. Senior Craig Needhammer (Lansdale, Pa./North Penn) smashed the school’s career all-purpose yards record, rushing 17 times for 76 yards, catching five passes for 50 more and posting 66 yards on three kickoff returns, as he surpassed the mark of 4,474 set by Josh Kleinfelter from 2007-10. Needhammer finished the game with 4,524. Widener (7-0 overall, 6-0 MAC) was led by the outstanding play of quarterback Seth Klein, who finished 25-of-37 for 347 yards and three touchdowns. Anthony Davis, a two-time All-American, caught eight passes for 165 yards and a score and Terrant Morrison posted 16 carries for 82 yards and a score. Widener finished with 514 yards of total offense while Lycoming posted 356. A series of missed opportunities for the Warriors led to the first Widener score of the game, as Lycoming forced the Pride to punt twice on their opening drive. A running into the kicker penalty and a fumble on the next punt set the Pride up at the two-yard line, where Morrison provided the opening touchdown. Lycoming responded with a nine-play, 52-yard drive that was capped on a 39-yard line drive for a field goal by freshman Devon Flynn (Levittown, Pa./Conwell-Egan Catholic). After a pair of stalled drives, the Pride travelled 67 yards in nine plays with the big play coming on a 35-yard pass to Philip Ragona over the middle. Max Kutler scored the touchdown with a one-yard run. The Lycoming defense responded after a 3-and-out by the offense, though, as junior Tyler O’Connell(Ogdensburg, N.J./Jefferson Township) got in on a sack and forced a fumble that was recovered by senior Braden Zeiner (Whitehall, Pa./Whitehall-Coplay) at the Widener 10-yard line. Jenny found senior Matt Cookson (Morrisville, Pa./Morrisville) in the end zone on the next play to cut it to a 13-10 game. As the second quarter began, the Pride marched 75 yards on 13 plays before Klein found Davis on a slant for a two-yard score. After a two-point conversion make it 21-10, the Warriors reached the three-yard line on their next drive, but Jenny was stopped on a quarterback sneak. Widener went on a 96-yard drive, with Ragona scoring on a five-yard pass from Klein with 1:31 left, helping the Pride take a 28-10 lead into the break. The Pride offense continued to gain yards in the third quarter, reaching the Lycoming 13, five and seven-yard lines on drives, but each time they were turned away, first on a missed field goal, then on downs and finally with an interception in the end zone by junior Mike Gentile (Havertown, Pa./Haverford) early in the fourth quarter. Lycoming quickly capitalized on the miscue, with Jenny breaking out of trouble and launching a 38-yard touchdown pass to a leaping Umpleby, who had already drawn a pass interference call on the play. Widener came back quickly, though, scoring in six plays, with Klein finding Blaine Prince for a 14-yard score to round out the scoring with 11:37 left. Senior Kyle Sullivan (Coatesville, Pa./Bishop Shanahan) led the Warriors with a career-high 13 tackles, also adding a breakup and a tackle for loss. Senior Jimmy Nottingham (Hightstown, N.J./Hightstown) added a career-high 10 stops along with a sack and Gentile also posted a career-high nine stops to go with his fourth interception of the year. Zeiner and junior Brian Campbell (Drums, Pa./Hazleton Area) each added seven tackles and O’Connell posted two tackles for a loss, a sack and five stops. Brandon Harper led Widener with eight stops and 2.5 for loss. Five different Widener players posted a sack and Sean Titus notched an interception. 2-7; VaughnNichols-Taylor 1-3; Max Kutler 1-1; Seth Klein 6-minus 13. 1-minus 2; Tyler Jenny 9-minus 9. PASSING: Widener-Seth Klein 25-37-1-347. Lycoming-Tyler Jenny 25-47-1-281. INTERCEPTIONS: Widener-Sean Titus 1-0. Lycoming-Mike Gentile 1-29. Needhammer 1-0; Ryan Umpleby 1-1. O'Connell 1-0; Cole Welham 1-0. Shakore Philip 0-1; Steve Gozur 0-1; James Rendle 0-1; Travon Barnes 0-1. 93-Shaviah Coleman, 95-Jermaine Reyes, 98-Devon Flynn.